Building in New York is tough and its expensive. Building in the close confines found in many parts of New York often adds an additional problem: you may need to access your neighbor’s property to perform part of the construction or to protect their property during construction. But you can’t just trespass on their property right? So what do you do? The answer is to enter into a “construction license access agreement” also sometimes referred to as a “construction license agreement” or just a “license agreement”. 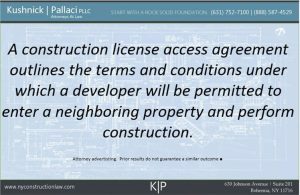 What is a construction license access agreement? A construction license access agreement is a written agreement between the developer (or owner or contractor) performing the work and the neighboring property owner and it outlines the terms and conditions under which access to the neighboring property will be permitted. What Terms Should be in a Construction License Access Agreement? A precise description of what work will be permitted on the neighboring property. Will there be scaffolding? Netting? Underpinning? When will access be permitted during construction? Is 24 hour access permitted 7 day a week 365 days a year or is it something less. What insurance will the developer/contractor provide to the neighboring owner to protect them from claims for injuries or property damage that occur as a result of the work being performed? What monitoring (optical, vibration, etc.) will be required on the adjacent property during the construction? Will there be a license fee paid to the adjacent property owner as consideration for allowing the access to his or her property? Will the fee be monthly or a lump sum? Will the developer reimburse the neighbor for their professional fees incurred in connection with the construction license access agreement? Who will be responsible for repairs and when must they be performed? These are just a few of the topics that can, and should, be covered in a construction license access agreement. These agreements important for both parties to make sure that they are “on the same page” regarding the work and what the rights and responsibilities of each party will be. We therefore strongly recommend that anyone entering into a construction license access agreement consult with an attorney. While many agreements conclude amicably, it is not uncommon for the parties to not be able to reach a resolution and, in those situations, litigation (through an RPAPL proceeding) can often be necessary to resolve the access issues. 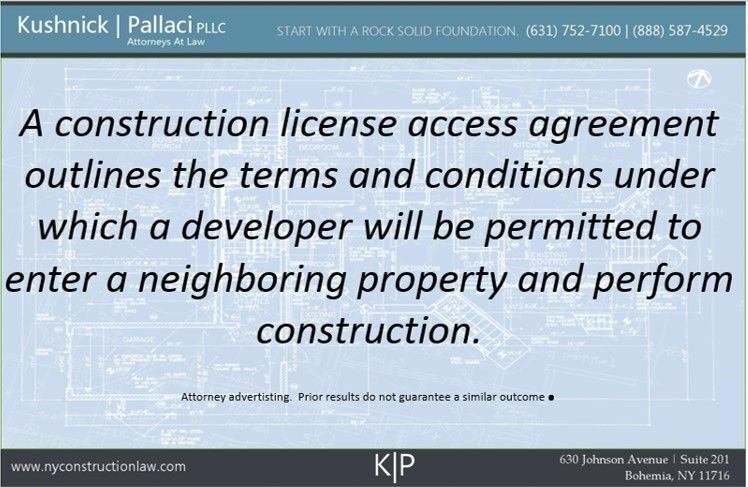 The construction attorneys at Kushnick Pallaci regularly draft and negotiate construction license access agreements. You can contact us here to discuss whether we might be able to help you too. This entry was posted in Adjacent Property Construction, Construction License Access Agreement, Construction Safety, Property Damage, Underpinning and tagged Adjoining Construction; Adjacent Construction, License Agreement by VTP. Bookmark the permalink.